There are many different competing vendors for virtual environments out there. Two of the major vendors are Microsoft and VMWare. While all of their products have more or less the same capabilities, each has its own quirks and peculiarities. Virtual machines are extremely useful tools for data storage. But your virtual environment is only as fault-tolerant as your server. Physical and logical damage to your server can lock you out of your virtual machines. If you’ve lost data from a Hyper-V virtual machine, our Hyper-V data recovery experts can help. 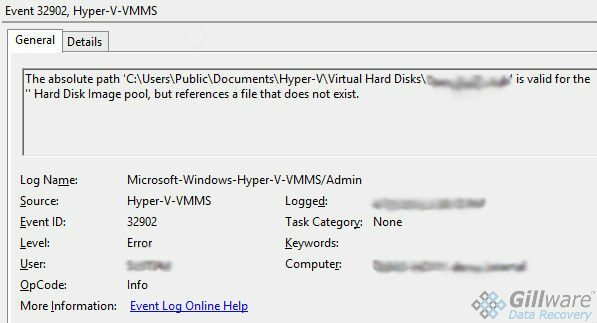 Using Hyper-V and can't get to your data? Gillware is here to help. Hyper-V is Microsoft’s Enterprise-class virtualization hypervisor. A hypervisor is the software that allows you to create virtual hard drives and virtual machines. Hyper-V is a Type I “bare metal” hypervisor, meaning that the hypervisor itself is the next step up from the hardware. In general, the hypervisor is the mediator between “host” machine and “guest” machine. The host machine is the actual physical device itself. The guest machine (or machines) is the virtual environment created by the hypervisor. A Type I hypervisor like Hyper-V (can you guess where the name comes from?) manages the server’s hardware the same way the operating system itself would. Type II embedded hypervisors, such as VMWare Workstation or VirtualBox, run inside an O/S just like a normal program. Hyper-V differs from an embedded hypervisor in that it occupies the spot in the “chain of command” where the host machine’s operating system would usually sit. Somewhat counter-intuitively, the operating system (Windows Server 2008, 2012, or 2016) is installed first. The Hyper-V kernel then inserts itself in betweenthe O/S and the hardware. This gives Hyper-V the control over the hardware that the Windows Server O/S usually has. Hyper-V creates a “parent partition” to contain the Windows Server O/S. Hyper-V can then create further “child partitions” to contain each virtual guest machine. The operating systems in the child partitions do not have any direct access to the server’s hardware. Instead, Hyper-V manages that on their behalf. Hyper-V data recovery from a crashed server or SAN can be a difficult and intensive procedure. Essentially, there are two data recovery cases going on in every virtual environment recovery scenario. First is the recovery of the files from the physical media. Second is the recovery of the files from the virtual media. If the server or SAN containing your Hyper-V virtual environments crashes, Gillware can help. In these situations, we commonly see the virtual machines stored on RAID-5, RAID-6, or nested RAID arrays. While these arrays are fault-tolerant, they are not failure-proof. A failure of multiple hard drives can occur for a variety of reasons. Our engineers will repair the failed hard drives in your server or SAN and reconstruct the array as best they can. Heavy damage to the drives can lead to “gaps” in the array. These gaps can affect the integrity of your Hyper-V virtual machines. Our Hyper-V data recovery technicians clone the recovered virtual environments onto physical hard drives for thorough analysis. Through clever use of status mapping, our technicians can cross-reference the failures on your server with the data on your virtual machines. Cross-referencing the status maps helps our engineers make sure we are obtaining the best Hyper-V data recovery results possible. If a Hyper-V virtual hard drive goes missing due to accidental deletion, you may see an error message like this: "The absolute path is valid for the " Hard Disk Image pool, but references a file that does not exist." One of the benefits of Hyper-V is that it is difficult to accidentally delete the virtual hard disk itself. Using Hyper-V Manager to remove a virtual workstation only deletes the checkpoints and configuration files and removes the virtual machine from its manager. The actual virtual hard disk file remains untouched, and you would have to go out of your way to delete it. That said, how many times have you intentionally deleted a file only to realize after the fact that you still needed something inside it? No matter how much stuff is inside a virtual machine, behind the magic your hypervisor makes to make it look like a real computer, it’s still just a really big single file. Your host machine’s filesystem determines where a file goes when it’s deleted. Windows Server 2008 uses NTFS, while Server 2012 and 2016 can both use NTFS and Microsoft’s new ReFS filesystem. In these filesystems, a deleted file doesn’t automatically disappear. Instead, the filesystem removes the flags that mark the clusters containing the file as “in use”. This becomes a big problem if your server remains in use afterward. Every new bit of data written to your server has a chance of overwriting part of the virtual machine. And that chance climbs higher and higher the more new data gets written. This can corrupt the critical files inside your Hyper-V virtual machine. After recovering your deleted VM, our technicians look through it and judge how much data, if any, has been corrupted. We can also recover deleted data from within a healthy Hyper-V virtual machine. Our technicians take the healthy virtual machine and clone it to one of our own hard drives. We can then perform a normal deleted file recovery operation on the now-physical disk. Our technicians can also recover data that has been lost after an accidental checkpoint revert operation.